The bombers entered the U.S. air defense identification zone near mainland Alaska Tuesday around 10:00 pm eastern time, and were accompanied by two Su-35 Flanker fighter jets, the command said in a statement. The latest incursion and aerial intercept followed another Russian bomber flights on Sept. 1 and comes as Moscow is engaged in the largest war games in more than 37 years in Central Asia and the Russian Far East. "The Russian aircraft remained in international airspace and at no time did the aircraft enter United States or Canadian sovereign airspace," NORAD said echoing past statements that appeared to minimize the provocative nature of the incursions. NORAD, however, released a photo of an F-22 flying close to one of the Russian bombers. During the Sept. 1 bomber incursion, the Tu-95s were not shadowed by Russian jets. However, defense officials said the bombers in that flight were supported by aerial refueling tankers. The bombers are capable of carrying nuclear-tipped KH-55 long-range cruise missiles that have a maximum range of up to 1,841 miles – enough to hit targets in Alaska and the U.S. west coast. The Navy's major ballistic missile submarine base is located at Bangor, Washington. Air Force Gen. Terrence J. O'Shaughnesy, NORAD commander, said the latest bomber incident highlights the need for continued air defense vigilance. "The homeland is no longer a sanctuary and the ability to deter and defeat threats to our citizens, vital infrastructure, and national institutions starts with successfully detecting, tracking, and positively identifying aircraft of interest approaching U.S. and Canadian airspace," O'Shaughnesy said in a statement. NORAD, the joint U.S. and Canadian command," employs a layered defense network of radars, satellites, as well as fighters to identify aircraft and determine the appropriate response," he added. No other details of the intercept were disclosed. Russian bombers in the past have conducted mock missile attacks against U.S. missile defenses in Alaska. 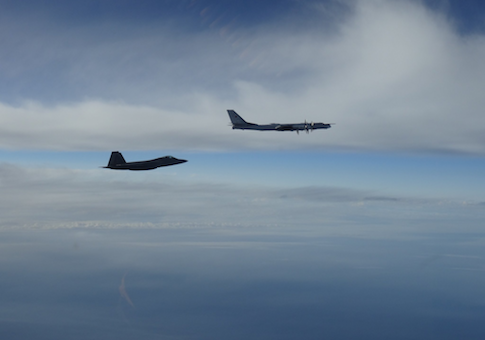 The bombers and jet fighters also were likely testing U.S. air defenses to gauge NORAD responses and how quickly they respond to incursions in protected airspace. The latest Bear bombers incursion coincided with the start of Russian war games known as Vostok-18 that Russian officials have said are the largest since 1981. The state-run Russian news agency TASS reported Wednesday that Tu-95 bombers practiced launching strategic nuclear cruise missiles that destroyed ground targets at a training base in Buryatia, a region of Russia north of Mongolia. The bombers were accompanied by Su-35s and refueling tankers and originated from a base in the Russian Far East, the Russian Defense Ministry said. An estimated 300,000 troops, 1,000 aircraft, and 900 tanks and military vehicles are taking part in the maneuvers held in central Asia near Mongolia and in the Sea of Japan, Bering Sea and Sea of Okhotsk.